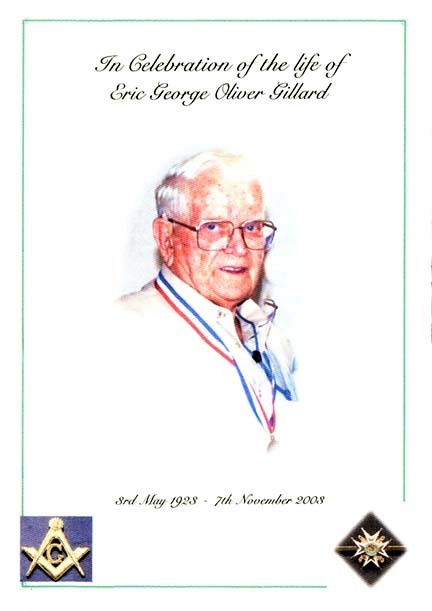 Chevalier Eric George Oliver Gillard JP, KLP was born in the Waikato on the 3rd of May 1928. After his schooling he began an apprenticeship as a fitter and turner with Robert Harwood, later known as Hamilton Engineers. While serving his apprenticeship, Eric manufactured the bolts for the Fairfield Bridge which is a modern landmark in the city of Hamilton. Eric then enlisted in the New Zealand Army Territorial Force and was posted as a trooper into the 4th Waikato Mounted Rifles and spent weekends away training as a soldier. At the outbreak of the Second World War, Eric was placed on the Active Service Roll and because if his background in engineering was transferred from the Mounted Rifles into the Royal New Zealand Army Mechanical Engineers (RNZEME), and was trained as an armourer. He was posted to the Middle East, and later to Italy and was a member of the Light Air Detachment (LAD), attached to the Tank Regiment of the 2nd New Zealand Division (2NZEF). During the war Eric was highly regarded for his skill and determination. No task was too big and his "can do" attitude was appreciated by all of the tank crews he worked with and supported. Like many of his generation, Eric spoke very little about his service during the war, preferring to share his experiences with fellow veterans in the local RSA after ANZAC Day services. At war's end in 1946, Eric returned to New Zealand and completed the final stages of his apprenticeship as a fitter and turner and joined a milking machine manufacturing company. In 1953, Eric's parents became unwell and he asked his employer for some time off so he could nurse them. His employer refused to release him stating that the company was far too busy, so Eric handed in his notice and quit his job. The next several years were tough for Eric, his wife Ivy, and their young family. Soon his weekend job became a full-time position. This job involved constructing clothes-lines in the newly-constructed State Housing, and he delivered firewood. Little by little his business grew and its focus shifted to engineering tasks. This business was the start of E.G. Gillard & Co. The primary role of his company was the servicing and installing of milking machines to dairy farms in the Waikato. Eric was later joined by his sons Ken and Robert. These two young men brought their own skills to the company. In 1962, Eric designed, constructed, and invented the slow squeeze valve which fitted on the air line of milking machines. The 1962 patent read "to control the squeezing action of the inflation on the cow's teats and to allow the inflation to assume its natural shape." Eric and sons moved their company from the family's backyard in Fairfield to a larger premises in Te Rapa, in 1972, and there the company diversified and expanded. This expansion included building grain silos, and working for the dairy company, Lands & Survey water supplies, outfitting the wool scouring plant at Ohinewai in northern Waikato. The company put down water bores on many properties in the region, and Eric is well remembered for his amazing skills as a water diviner. In 1980, Eric retired and the company was taken over by his sons, Ken and Robert. Eric was never happy being idle and so his private workshop was of immense interest to him. He spent many hours tinkering on one project or another. He manufacturered different "bits and bobs" that were put to good use by the Northern Commandery of the Order of Saint Lazarus. He often spent many hours at the Order's Retirement Village located in Raglan, on the West Coast. Eric's mechanical and "fix-it" skills were invaluable. He was involved in many community organisations including the Royal New Zealand Returned Services Association, the Order of Saint Lazarus, the Order of the Eastern Star, and the Masonic Lodge. He was a Justice of Peace and served many times on the bench. Eric was the past president of the Waikato Justices of the Peace Association. Eric died peacefully at his home, in Hamilton, on the 7th of November 2003, surrounded by his family. He is survived by his wife Ivy, his sons Ken and Robert, a daughter Linda, ten grandchildren, and nine great-grandchildren. Chevalier Eric Gillard JP, KLJ is remembered as a man whose word was his bond. He paid his bills on time, called a spade a spade, and when he shook hands, with a man, he looked him straight into his eyes. A man of high principles, he always gave his total committment to any task or project that he became involved with. Eric was a true gentleman.